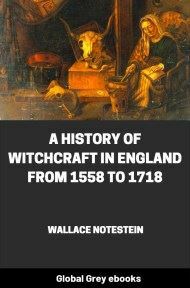 A look at witchcraft in England in the 16th - 18th Centuries. Very heavy with footnotes; however, don't let that put you off because it's an interesting read. It has been said by a thoughtful writer that the subject of witchcraft has hardly received that place which it deserves in the history of opinions. There has been, of course, a reason for this neglect—the fact that the belief in witchcraft is no longer existent among intelligent people and that its history, in consequence, seems to possess rather an antiquarian than a living interest. No one can tell the story of the witch trials of sixteenth and seventeenth century England without digging up a buried past, and the process of exhumation is not always pleasant. Yet the study of English witchcraft is more than an unsightly exposure of a forgotten superstition. There were few aspects of sixteenth and seventeenth century life that were not affected by the ugly belief. 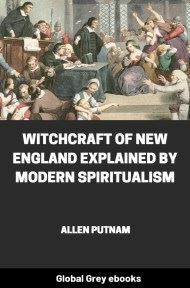 It is quite impossible to grasp the social conditions, it is impossible to understand the opinions, fears, and hopes of the men and women who lived in Elizabethan and Stuart England, without some knowledge of the part played in that age by witchcraft. It was a matter that concerned all classes from the royal household to the ignorant denizens of country villages. Privy councillors anxious about their sovereign and thrifty peasants worrying over their crops, clergymen alert to detect the Devil in their own parishes, medical quacks eager to profit by the fear of evil women, justices of the peace zealous to beat down the works of Satan—all classes, indeed—believed more or less sincerely in the dangerous powers of human creatures who had surrendered themselves to the Evil One. But these notions were to reach England soon enough. Already there were germinating in southern Europe ideas out of which the completer notions were to spring. As early as the close of the ninth century certain Byzantine traditions were being introduced into the West. There were legends of men who had made written compacts with the Devil, men whom he promised to assist in this world in return for their souls in the next. 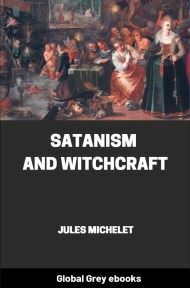 But, while such stories were current throughout the Middle Ages, the notion behind them does not seem to have been connected with the other features of what was to make up the idea of witchcraft until about the middle of the fourteenth century. It was about that time that the belief in the "Sabbat" or nocturnal assembly of the witches made its appearance. The belief grew up that witches rode through the air to these meetings, that they renounced Christ and engaged in foul forms of homage to Satan. 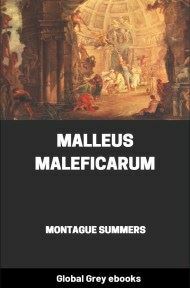 Lea tells us that towards the close of the century the University of Paris formulated the theory that a pact with Satan was inherent in all magic, and judges began to connect this pact with the old belief in night riders through the air. The countless confessions that resulted from the carefully framed questions of the judges served to develop and systematize the theory of the subject. The witch was much more than a sorcerer. Sorcerers had been those who, through the aid of evil spirits, by the use of certain words or of representations of persons or things produced changes above the ordinary course of nature. "The witch," says Lea, "has abandoned Christianity, has renounced her baptism, has worshipped Satan as her God, has surrendered herself to him, body and soul, and exists only to be his instrument in working the evil to her fellow creatures which he cannot accomplish without a human agent." This was the final and definite notion of a witch. It was the conception that controlled European opinion on the subject from the latter part of the fourteenth to the close of the seventeenth century. It was, as has been seen, an elaborate theological notion that had grown out of the comparatively simple and vague ideas to be found in the scriptural and classical writers. It may well be doubted whether this definite and intricate theological notion of witchcraft reached England so early as the fourteenth century. Certainly not until a good deal later—if negative evidence is at all trustworthy—was a clear distinction made between sorcery and witchcraft. The witches searched for by Henry IV, the professor of divinity, the friar, the clerk, and the witch of Eye, who were hurried before the Council of Henry VI, that unfortunate Duchess of Gloucester who had to walk the streets of London, the Duchess of Bedford, the conspirators against Edward IV who were supposed to use magic, the unlucky mistress of Edward IV—none of these who through the course of two centuries were charged with magical misdeeds were, so far as we know, accused of those dreadful relations with the Devil, the nauseating details of which fill out the later narratives of witch history.